Do you plan to invest EUR 700,000* or more but prefer not to spend precious time doing so? If you lay down the guidelines for the investment, our investment specialists will do the work for you. 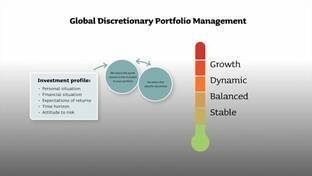 Global Discretionary Portfolio Management is based on interaction between you, your personal adviser and our investment specialists. Together we will define your investment profile and draw up an investment strategy matching your profile. Then a professional investment team will on an ongoing basis monitor and adjust your investments. You may invest in three different currencies: euro, US dollars and pound sterling. * As each of our clients has a unique investment profile, the amount is only indicative. The final investment amount will be agreed upon in cooperation with your personal adviser.